Our Abpromise guarantee covers the use of ab58201 in the following tested applications. 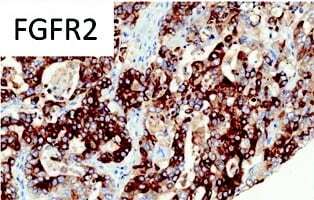 FGFR2 antibody (ab58201) used in immunohistochemistry at 5ug/ml on formalin fixed and paraffin embedded human stomach carcinoma tissue. 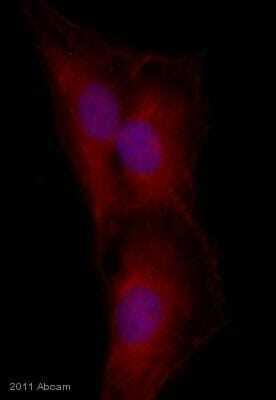 Immunocytochemistry/ Immunofluorescence - Anti-FGFR2 antibody (ab58201)This image is courtesy of an anonymous Abreview. ab40880 staining FGFR2 in Human glioblastoma cell line D54MG by Immunocytochemistry/ Immunofluorescence. Cells were fixed in paraformaldehyde and permeabilized in 0.1% Triton X-100 prior to blocking in 0.5% BSA for 30 minutes at room temperature. The primary antibody was diluted 1/50 and incubated with the sample for 16 hours at 4°C. 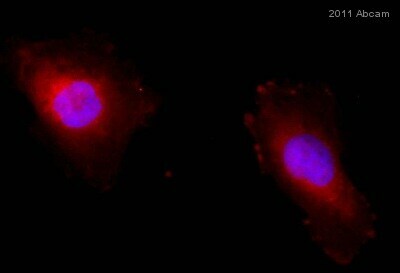 The secondary antibody was TRITC-conjugated Goat anti-Mouse polyclonal, diluted 1/300. Overlay histogram showing HeLa cells stained with ab58201 (red line). The cells were fixed with 80% methanol (5 min) and then permeabilized with 0.1% PBS-Tween for 20 min. 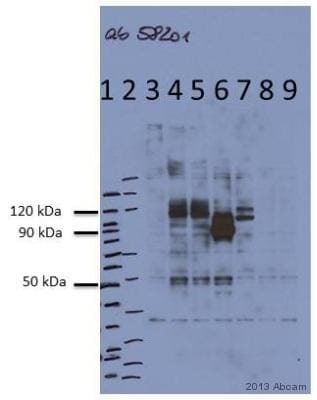 The cells were then incubated in 1x PBS / 10% normal goat serum / 0.3M glycine to block non-specific protein-protein interactions followed by the antibody (ab58201, 2µg/1x106 cells) for 30 min at 22ºC. The secondary antibody used was DyLight® 488 goat anti-mouse IgG (H+L) (ab96879) at 1/500 dilution for 30 min at 22ºC. Isotype control antibody (black line) was mouse IgG2b [PLPV219] (ab91366, 2µg/1x106 cells) used under the same conditions. Acquisition of >5,000 events was performed. 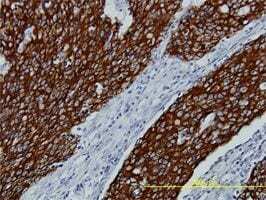 Immunohistochemistry (Formalin/PFA-fixed paraffin-embedded sections) - Anti-FGFR2 antibody (ab58201)Image from Guo T et al., J Proteome Res 11:3405-3413 (2012). Epub 2012 May 7. Fig 4.; DOI: 10.1021/pr300212g; April 25, 2012, J. Proteome Res., 2012, 11 (6), pp 3405–3413 with permission from the American Chemical Society. 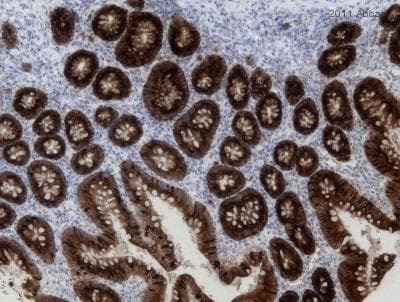 Immunohistochemical analysis of Human gastric adenocarcinoma, staining FGFR2 with ab58201 at 0.2 µg/ml. Publishing research using ab58201? Please let us know so that we can cite the reference in this datasheet. Will it be possible to know which isoform for the Uniprot: P21802 used as immunogen. I did my staining and got an unexpected profile and just wanted to make sure it doesn't cross react with FGFR1. As the datasheet indicates, the immunoge sequence used to raise ab58201 was a recombinant fragment, corresponding to amino acids 621-724 of Human FGFR2 (the exact sequence is commercially sensitive information). Both serve to break the methylene bridges and so expose the antigenic sites in order to allow the antibodies to bind. Some antigens prefer enzymatic to heat mediated antigen retrieval and vice versa. Enzymatic tends to be a much gentler process than heated mediated, so is best suited to more friable tissues. However, enzymatic tends to take longer and is more technically demanding. If no antigen retrieval step is stated on the antibody data sheet, start off by trying the heat mediated pressure cooker method. phone call: good signal in IHC, no signal in WB though. Selon nos informations vous avez connu quelques difficultés avec ab58201 et avez contacté notre service scientifique. Après étude de notre correspondance, nous remarquons que nous sommes toujours en attente du questionnaire qui nous permettrait de vous aider à résoudre ce problème. Si vous avez déjà envoyé ce questionnaire, il semble que celui-ci n’est pas était pris en compte par notre système et je vous serais gré de me le transmettre de nouveau. Veuillez nous excuser par le désagrément causé par cette mesure. Dans le cas contraire, pourriez-vous me faire savoir si vous avez déjà résolu ce problème et ainsi nous pourrions clore ce dossier dans notre système. Je suis désolée que le ab58201 ne vous donne pas de bons résultats en Western blot. Veuillez trouver ci-jointle questionnaire que nous avons discuté au téléphone et qui nous permet de regrouper le plus d'informations possible sur le protocole que vous avez utilisé avec cet anticorps. Celui-ci nous permettra de vous fournir la meilleure assistance technique. 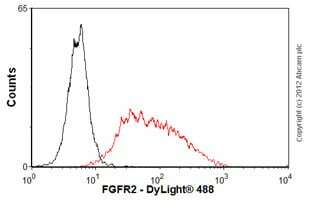 What is the crossreactivity of this antibody with FGFr1,3 and 4? and whats the specificity with isoform IIIb and IIIc? As indicated on the datasheet, the immunogen used to raise ab58201 is aa 621-724 of the Human FGFR2 (http://www.uniprot.org/uniprot/P21802). This fragment shows 94% homology with FGFR1, 95% with FGFR3, 89% with FGFR4, 100% with isoforms IIIb (http://www.uniprot.org/blast/?about=P21802-18) and 100% with IIIc (http://www.uniprot.org/blast/?about=P21802-5).